Honda is taking a number of models from its line-up to the MCN London Motorcycle Show this week. 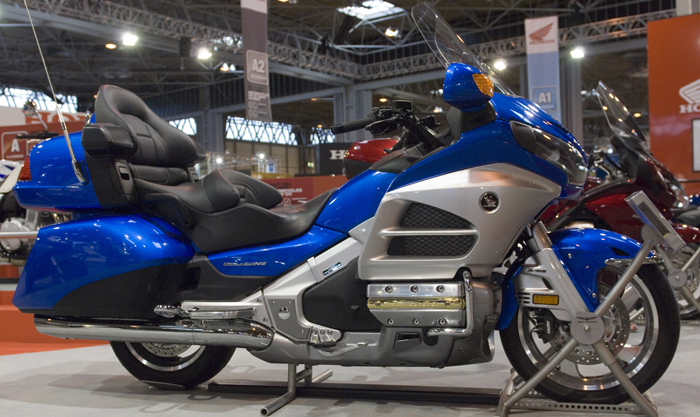 Grabbing the limelight will be the Gold Wing 40th anniversary edition and a range of VFR models. The Gold Wing’s birthday version comes with new colour schemes and limited edition 40th anniversary emblems across the model, including on the pillion seat back rest, front fairings and top box. It also comes with a flat six, 1800cc engine, cruise control and a reverse gear. Also on show at the ExCeL centre in London is the VFR Sports Tourer line-up with the 800X version, revealed in September 2014, on show alongside the 800F, 1200F and 1200X. The 800X, the latest VFR iteration comes with a comprehensive list of electronics and rider aids including a selectable torque control system, LED lighting and a satnav system, all as standard. The powertrain on the VFR800X has also been tweaked, with more mid-range torque and top-end power available, says Honda. The Honda line-up will be on display at the MCN London Motorcycle Show which takes place at ExCeL London convention centre from Friday 13 February to Sunday 15 February. Also on show in London are a selection of motorbikes from Valentino Rossi’s race career, as well as a number of bikes from the private collections of James May and Richard Hammond of Top Gear fame.